I crawled under the porch to remove some debris and pull some weeds, and while I was there, I reached up to remove an old bird's nest from a piling. The nest had been there for at least a month or two and I expected that the young were hatched and gone. To my surprise, I found myself looking down at one beautiful robin's egg. I showed it to Griffin and Georgi and put the nest back. I hadn't seen a robin near the nest since it was built. Was the egg abandoned or was the mother away for the moment? I also found faded, brittle remains of another egg on the ground. It appeared to have hatched. A week went by and there was no sign of a mother. What I had gathered about robins in the meantime (hypotheses below) led me to believe this egg had been abandoned, so I took the nest down and Griffin and I studied it and finally brought it to his classroom today, where the children are enjoying observing it. Griff tells me that somebody accidentally poked a tiny hole in the shell and they're pretending the egg is hatching. I wonder what's actually inside that shell. 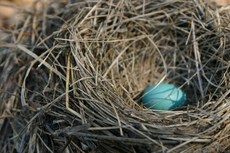 American Robin nests are composed of grass and twigs, held together with mud and lined with fine grass. 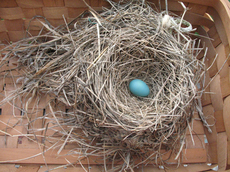 Paper and feathers are also often found in the nests. robins usually have 2-3 broods during mating season. Clutches range from 2-5 eggs, usually 3-4. Each new brood is raised in a new nest. robins sometimes build multiple nests simultaneously and might lay 1-2 eggs in each before selecting one nest, laying more eggs, and incubating them. Might applies to what is possible; may to what is permissible.